With 2019 approaching, the Digital Marketing landscape is going to witness a dramatic change. Some of the most common trends and tactics will become outdated while innovations and practices will disrupt the market. There are many new digital marketing trends and strategies that are evolving swiftly in the current high tech, internet dominating era that businesses need to adapt to and start practicing in order to succeed in their efforts and stay ahead of the game. One such crucial and emerging movement in the business landscape is Inbound Marketing. It’s a no hidden fact that buyers have more power today when it comes to making buying decisions as compared to previous times when the internet was not much accessible. Today, people tend to gather all the information around any product or service they want before actually buying it. This is where Inbound Marketing comes in! The inbound methodology, along with technology, helps businesses adapt to fast-changing needs of customers in today’s era. Inbound Marketing is a method of attracting, engaging and delighting prospects/customers to grow a business by providing value and trust. It is a way of marketing your product/services in a personalized manner that provides real value to the customers. Unlike outbound marketing, you don’t reach out to your customers through pushy content or paid ads. Instead, Inbound Marketing methodology helps you create meaningful content that addresses the problems and needs of your ideal customers and hence, attracts quality prospects on your business website by building trust and credibility for your business. Every business aims at attracting the potential buyers, converting them into customers and then delighting them to turn them into brand advocates. The very first step of Inbound Marketing starts with defining business goals and buyer personas. Your business goals could be spreading brand awareness, lead generation, engaging current customers for retention or upsell, increasing overall business sales, etc. Once, you have defined your business goals, you start building your buyer personas. Buyer Personas are semi-fictional representations of your ideal customers that you want to attract to your website. Obviously! You wouldn’t want junk traffic that won’t help you meet your business goals. Now, you have your business goals and buyer personas in place and you can start forming your Content Marketing strategy to help you in achieving the desired business goals. 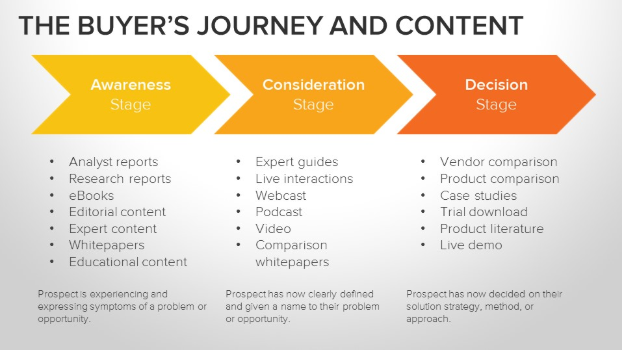 Inbound content is produced keeping in mind the buyer’s journey. Now, if you’re thinking what a buyer journey is? Have a look at the image below. Basis the prospect’s buying stage, content is created to cater to their needs and problems at the right time in the right form. So, people who are at the awareness stage can be given information through value-driven blogs, ebooks, whitepapers that will help them identify the problem they are facing and how they can solve them. Once, the buyer has identified the problem and starts looking for potential solutions, video, podcasts or comparison-based content can be given in order to help them finalise their ultimate solution. Now, the prospect has identified the solution and has reached the decision stage of buying the solution which could be a product or a service from the brand options available in the market. Here, content forms like vendor comparison or case studies will help the buyer in finally selecting a particular brand over others. Not only this method helps in increasing Marketing qualified and Sales qualified leads but also helps in enhancing the overall customer experience. Now, you know what Inbound Marketing is and how it works, let’s have a look at the crucial Inbound Marketing trends that are going to dominate in 2019. Obviously, what worked for businesses last year might not work this year. We all know that with Google coming up with new algorithms now and then, the SEO tactics keep changing with time. The competition to get found in Search Engine results is so intense that SEO practices have now evolved into a new model – Topic Cluster Model. All the content focused websites have already started leveraging this technique to stay ahead in the game. In this method, a single ‘pillar’ page acts as the main content for a particular topic and multiple sub-content pages related to the same pillar content are created and linked back to that pillar page and each other. This inter-linking sends signals to the search engines that the pillar page is an authority on the topic and over a period of time the probability of ranking that page higher on search engines for that particular topic – increases! It’s a way of organizing a website’s content in a structured manner. Search engines have upgraded and evolved their algorithms according to customer’s behavioral changes and hence, it is time for brands to adapt to the new model in order to put up with the changing market. According to Gartner, by 2020, customers will manage 85% of their relationships without talking to a human. Marketing Automation allows brands to reach out to and engage with customers across various digital channels like email, social media, blogs, chatbots, etc. It enables you to prospect and engage with your customer in a more personalized and targeted manner as opposed to bulk targeting. Also, the inbuilt AI-based algorithms help brands with insights that are useful when it comes to executing laser-sharp marketing campaigns. The overall analytics and information shared about leads and customers help in optimizing the marketing efforts to its fullest potential and hence, growing the business in the right direction. Not only that! Imagine how much time it saves by automating the repetitive marketing tasks that can be performed without human intervention. And, time is money! So, an integrated platform that allows you to execute your marketing efforts, manage your campaigns in a centralized manner and strategically integrate your marketing and sales, will certainly be the most sought-after software in 2019. HubSpot is one such platform that enables you to execute closed loop marketing with tools such as CRM, Marketing and Sales among others. Chatbots not only help in improving customer experience by answering real-time queries but also help in converting visitors into leads. Automated chatbots can interact with the website visitors by answering their queries in real time and providing them with a solution or connecting them with the sales representatives right away, hence, reducing the sales lifecycle time. Chatbots can be easily integrated with a website, social account or other apps. They also gather information that can be used later for targeted marketing campaigns. According to research, the global chatbot market is reaching $1.2 billion with 24% annual growth rate. It’s time for brands to start strategizing on how they can integrate chatbots in their overall marketing plan and reap the benefits as other market leaders have already been doing. According to TheeDesign, approximately one-third of the 3.5 billion searches performed on Google are voice searches. With increasing adoption of Alexa, Apple Siri, Cortana, Google now as a primary source of search, brands are now focusing on Voice SEO as critically as they are on On-page SEO. Imagine this scenario – When people search on Google or any search engine by typing a text query, a lot of options pop up for the user to select. However, when a user asks Siri, or Google Now for a search query, very few options come up. In fact many times, only one result pops up. And, if your brand happens to appear in that one search result, the CTR will potentially be much higher. Hence, brands should pay utmost importance to strategize and implement their Voice-based SEO strategies. Newsflash! By 2020, half of all search queries will be voice-based. – (Source – ComScore). So, you must gear up to include Voice-based SEO as a part of your Inbound Marketing plan right away! Video Marketing has been a very important part of Inbound Marketing and it’s only going to grow! Of all the Inbound Marketing trends you are going to witness in the future, this one is going to stay for long. By 2019, Videos will account for 85% of the total online traffic (source). Also, 54% of internet users watch video on a social media platform on a monthly basis, and this is expected to grow in the coming years. With so much content available on the internet, the attention span of users has gone down considerably. Hence, people prefer to consume information about products or services through explainer videos, vlogs, etc. Summing it up – Be it the dissemination of information about a product, promotion of new service, online education or increasing sales figures, video marketing has come up in a huge way when it comes to business growth and cannot be ignored at any level while creating a marketing plan for any brand. According to State of Inbound 2017, social selling is rapidly gaining traction, especially in the B2B market segment. Social selling is the process of building long-lasting relationships with potential customers through the use of social media platforms like Quora, LinkedIn, Facebook, etc. The idea is to avoid cold calling or direct purchase conversations and instead build relationships with the prospect by answering their questions, making suggestions and helping prospects by providing them with useful information till the time they actually decide to make the purchase. Not only it helps you in generating new leads, but also in nurturing existing prospects and clients by staying connected with them and providing them with meaningful support. Social selling is one Inbound Marketing trend that picked up in the last few years and is going to grow aggressively in the upcoming ones. LinkedIn works best for the B2B market while Facebook and Instagram for the B2C market. Guest blogging is one of the famous Off-page SEO tactics. However, when done along with PR as part of the Inbound Marketing strategy, it works wonders. How to do that? 1. Write meaningful SEO-friendly content that resonates with your buyer persona. 2. Use Digital PR to get your article published on high authority websites in your domain. This will not only help you in increasing the traffic to your website through quality backlinks but will also help you generate higher authority for your website as Google will pass on the link juice from those high authority PR websites to yours. It’s a great hack to generate quality leads and get high authority from Google. It is one of the Inbound Marketing Trends in 2019 that’s going to be accepted by more brands for the value it delivers – both tangible and immense. So, what are you waiting for? You are now aversed with the Inbound Marketing trends that can exponentially boost your marketing ROI and business growth in 2019. Add them to your Inbound Marketing 2019 plan and see them work for you! Want to grow your business with Inbound marketing and marketing automation? Contact us!